Jeremy (left) and Paul Stedman (right) of Worcester County, MA with the bluefish they caught after fluke fishing near the Newport Bridge earlier this month. I fished in the Newport area this weekend and saw schools of bluefish working in the Bridge area. As I returned to Greenwich Bay, I came upon five separate schools of bluefish between Quonset and Prudence Island, all pushing bait to the surface in feeding frenzies. It made me think about all the fun anglers on my vessel (particularly my wife and I) have had fishing for blues on the surface. Well it is time we gave bluefish the place they deserve… after all they are a ferocious game fish and when the catch is cared for properly, out of the water to the dinner table, they are very tasty. We owe it to ourselves and nature to eat what is provided and bluefish are nutritious, plentiful and economically beneficial to catch and eat. I feel the same way about scup that have appeared in large numbers too. We should educate ourselves, family and friends on how to prepare and eat these plentiful fish. Bluefish are fairly easy to find, but that has not always been the case. Bluefish populations have experienced periods of abundance and scarcity. Massachusetts Marine Fisheries relates “…the number of reproductively mature fish has declined since its most recent peak in 1979, dropping the estimated number of adults coast wide… in recent years, the total harvest by recreational anglers (which is typically at least 90%) has been stable.” In 2009 the Mid-Atlantic Fishery Management Council declared the fishery fully rebuilt and in 2010 Rhode Island increased the possession limit for bluefish to be consistent with Federal regulation from ten fish to fifteen fish/person/day with no minimum size and no closed season. These regulations are in effect for 2011 as well. Small bluefish arrive in New England Bays and estuaries in May, larger fish arrive later in spring and leave in October as the water cools to sixty degrees. They inhabit deeper waters and move into shallow areas as the summer progresses. Bluefish are cannibalistic. Wikipedia says some “Hypothesize that because of cannibalistic behavior, bluefish tend to swim in schools of similarly sized specimens. Others hypothesize that bluefish school with like-sized individuals, because they swim at the same rate, thus expending the same energy when traveling, and thus having identical food intake requirements.” Bluefish feed in schools aggressively pursuing prey along tidal rips and in shallow areas close to shore where food can be trapped. Bluefish aggressing rip through schools of prey biting and killing many fish that do not get eaten. Anglers use steel leaders when fishing for bluefish as their teeth can easily cut monofilament line. Anglers must be extremely careful when handling bluefish, particularly when removing hooks as they can bite and cut anglers causing severe damage (and in some cases finger loss). Bluefish rarely exceed 20 lbs. and 40 inches in length. The larger fish caught during a given year generally run between 10-15 pounds. The Rhode Island record is 26 pounds, 39 inches caught by D. Deziel of Woonsocket, RI in August of 1981 and the North American record bluefish, caught in North Carolina, weighed 31 pounds, 12 ounces. 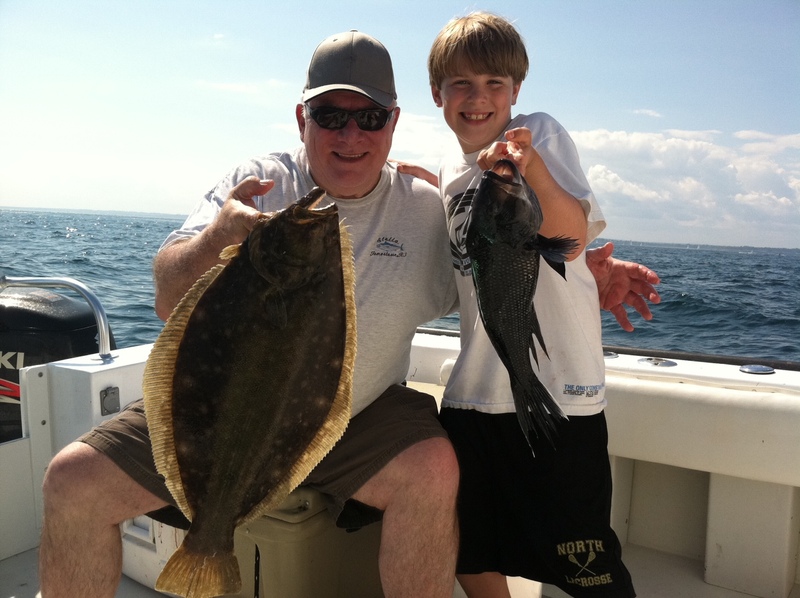 Watch next week’s No Fluke column for tips on how to care for and cook your bluefish catch from water to dinner table. NOAA Administrator Jane Lubchenco, Ph.D. joined Rhode Island Governor Lincoln Chafee, U.S. Senators Jack Reed and Sheldon Whitehouse, and other national and state leaders last Friday to recognize the pioneering Rhode Island Ocean Special Area Management Plan (visit Ocean SAMP at http://seagrant.gso.uri.edu/oceansamp/ ). This new, innovative ocean management plan is the first of its kind in the nation. It improves state review processes and policies to facilitate the development of offshore projects that could lead to the creation of hundreds of wind energy jobs and balance energy development with transportation, fishing, recreation and environmental stewardship along the state’s coast and adjacent federal waters. I asked Captain Rich Hittinger, vice president of RISAA, how RISAA felt about the possibility of wind farms in RI. Rich said, “We are not opposed to the platforms as long as they avoid prime fishing spots and they are constructed in a manner that enhance bottom structure and fish habitat and so long as they are not made off limits by some form of "safety zone". Rich said at Friday’s event he chatted with Ed LeBlanc of the United States Coast Guard (USCG), the person responsible for wind platform issues in the Northeast, and LeBlanc said there is no interest on the part of the USCG to have any form of safety zones. Captain Rick Bellavance, president of the Rhode Island Party & Charter Boat Association, said, “NOAA’s approval of the SAMP is good, it can be used as a tool to apply consistency in Federal waters.” However, Captain Bellavance cautioned, “The decision as to where to site windmills in Federal waters is out of State control, actually out of the hands of NOAA and the Department of Commerce, but rather it is now in the hands of the Department of the Interior”. He hoped wind farm developers would be required to conduct “Extensive environmental impact studies rather than the less extensive environmental assessments.” He said this is now not guaranteed. Concern is not just over 100 or 200 wind turbines but the thousands of wind turbines planned for the northeast. Commercial fishermen have related that it would be impossible to turn a vessel dragging nets in a wind farm. This may eliminate prime fishing grounds. For example the proposed Deepwater Wind farm places turbines around the rim of Cox’s Ledge where water depth is lower and ideal for turbine placement. However, this location has been a prime fishing ground for commercial (and recreational) fishermen for years. Lobstermen, who set their pots along natural structure, would no longer be able set pots in a string in this area. Additionally, the artificial structure created by wind turbine foundations may attract the lobsters, and leave few for lobstermen to fish for in open fishable water. The East Bay Anglers will sponsor a clam boil Sunday, August 14, 2:00 p.m. at the Riverside Sportsman’s Club. 50/50 raffle, door prize and a prize raffle. Must reserve tickets in advance by calling Mike Gillies, 401.228.6310. Striped bass bite remains good off Block Island North Rip and southeast side. Angler Jamie Schiffer said striped bass were on the surface at the North Rip this weekend, “It was crazy. I couldn't believe how long it lasted. 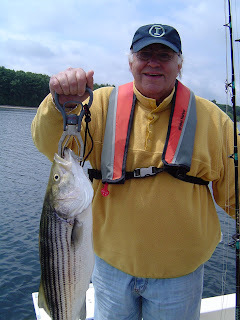 Stripers were anywhere from 28 to 45 inches”. Bass are also being caught off coastal shores in Newport and Narragansett. “Customers have said striped bass were swimming among bathers a Scarborough Beach”, said Buzz, an associate at Maridee Bait, Tackle & Canvas on Point Judith Road, Narragansett. Blue crabs have made their presence know in the East and West Bay passages. Still not as strong as last year, but anglers and crabbers hope they will become plentiful soon. Bluefish schools heavy in the West Passage north of Jamestown to Greenwich Bay. Fish also surfacing under the Newport Bridge mixed in with school striped bass. 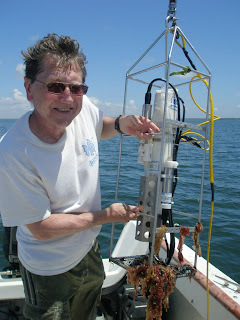 Chris Deacutis, PhD and chief scientist for the Narragansett Bay Estuary Program with a Seabird oxygen-temperature-salinity sampler. Chris has been working on the issue of excess nutrients (nitrogen) and low oxygen in the upper half of Narragansett Bay for ten years. Bob Anderson of East Providence and his son-in-law Ben Vosper of Tucson, AZ with the keeper fluke they caught while fishing under the Newport Bridge. Jeremy (left) and Paul Stedman (right) of Worcester County with the bluefish they caught after fluke fishing near the Newport Bridge last week. “I need to breath. Quick... find me some oxygen” said the Greenwich Bay summer flounder to the striped bass. “Hurry… follow me to the deep hole off Warwick Neck where there’s plenty of oxygen to breathe” said the bass. Fish may not communicate like this but they certainly position themselves in places where there is food and oxygen. Today things are better but Bay advocates are still combating nutrients in the Bay that create algae blooms (which actually create oxygen). But as algae decays it uses oxygen and reduces the oxygen level in the water, often times well below the levels that fish need. This low oxygen level has occurred in Greenwich Bay in the summer as well as in other parts of the Bay. With a prevailing southwest summer wind in Narragansett Bay, Greenwich Bay (particularly East Greenwich Cove), does not get flushed and low oxygen levels are more prominent there according to the NBEP which measures oxygen levels in the Bay. In fact, “The famous menhaden fish kill of August 2003 was clearly caused by a sever hypoxia (actually anoxic – no oxygen) events that centered on western Greenwich Bay”, said Chris Deacutis. The NBEP eliminated the East Passage, the Mt. Hope Bay and the lower Bay from measurement because oxygen levels in these areas are good. The channel in the east passage acts as a conduit for flushing and mixing. Oxygen levels in deep water off Warwick Neck mix well too due to the water passing from the east to the west passage and back. Water at Quonset Point and south have good oxygen levels too. Dr. Deacutis said, “Early on, sewerage treatment plants did a good job of taking solids out of the waste but nutrients have just started to be addressed in the Bay by treatment plants in the past five years." Plants that have been treating for nutrients include Warwick, Cranston, East Greenwich and the Narraganesett Bay Commission. The Field’s Point plant plans to start treating nutrients in 2013 said Deacutis. So I asked Dr. Deacutis what low oxygen levels and poor mixing means for recreational and commercial fishing in the Bay. Fisherman should advocate for and support programs that aim to clean water and lower nutrient levels. Anglers should also support efforts to plant sea grass as the grass acts as a haven for small marine creatures and bait that large fish feed on. Oxygen levels in upper, mid and low water levels seem to explain a few things about fishing in the Bay. Fishing at Warwick Neck has been always been good; this could be due to the water moving, tossing around bait as well as the oxygen levels mixing well throughout the water column including the bottom of the water column where large fluke have been taken in recent years. Fishing in the East passage is also good… due to bait fish and menhaden runs up the East Passage to the Providence River in the spring, but one has to wonder if the flushing and mixing that provides better oxygen supply and mixing in the water column is also contributing to better fishing. Greenwich Bay fishing is good in the spring with great school striped bass fishing and blue fishing throughout the summer months. Fishing here slows down in the summer but bluefish tend to feed at the top of the water column and are not as affected as much by low oxygen levels. For more information visit the NBEP website at www.nbep.org and an associated blog at http://nbep.wordpress.com/ . Brown University hosts the dissolved oxygen (DO) website (called Insomniacs) which has oxygen level maps of various Bay areas. For this website visit http://www.geo.brown.edu/georesearch/insomniacs/index.html . 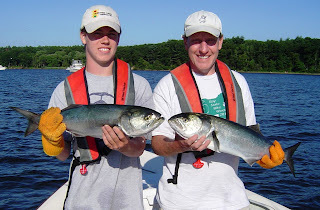 Two local sport fishing advocates, Stephen Medeiros, president and executive director of the Rhode Island Saltwater Anglers Association (RISAA) and RISAA member Capt. Alan Anderson were among the five winners of Sport Fishing Magazine's "Making A Difference Awards." The winners were announced on Wednesday. The awards are given to "individuals who have made a positive difference in saltwater recreational fishing." NOAA announced the Aquaculture Technology Transfer Initiative last week which will foster public-private partnerships on regional projects that showcase innovative sustainable practices, jump start private sector investments, and create employment opportunities in coastal communities. Bluefin tuna fishing is good. Jay Fissette of Coventry said, “We were on our way home, just south of the Fairway buoy when one of our lines went off and we boated our first bluefin of the season.” Many captains say bluefin have been more plentiful in the past five years. Last week, NPR reported scientists now believe bluefin are spawning somewhere other than the Gulf of Mexico. The fish move quickly, a fish tagged on the east coast of the US traveled to Europe in just 53 days. Last week NOAA announced the United States joined more than 50 countries in a recommendation to regional fishery management organizations (Ramos) to better track vessels engaged in illegal, unreported and unregulated (YOU) fishing for tuna and other highly migratory species. Striped bass fishing is good off Block Island and coastal southern shores. Bay fishing has slowed dramatically. Last week Governor Chaffee signed a striped bass bill calling for stiffer penalties on those taking striped bass illegally. RISAA successful advocated for the bill. 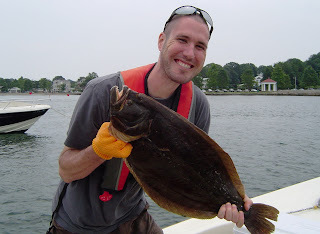 Fluke fishing is very good with anglers catching keeper fluke around Newport and Jamestown south of the bridges. Bob Anderson and his son-in-law Ben Vosper caught keeper fluke just south of the Newport Bridge alongside Rose Island last Thursday aboard No Fluke Charters. Anglers filing fishing reports on the RISAA blog report a good fluke bite with shorts mixed in. Francis Fleet vessels and the Seven B’s party boats report a good fluke bite last week. Fish in the seven to eight pound range were caught Saturday on the Seven B’s with the largest fish weighing nine pounds. AJ Petrarca, West Warwick, RI with a monster black sea bass he caught while fishing Kettlebottom Outfitters, Jamestown, RI. Albert Bettencourt (left) and his grandson Nathan (right), both from East Providence, with fluke 25 plus inch fluke they caught off Newport last week. 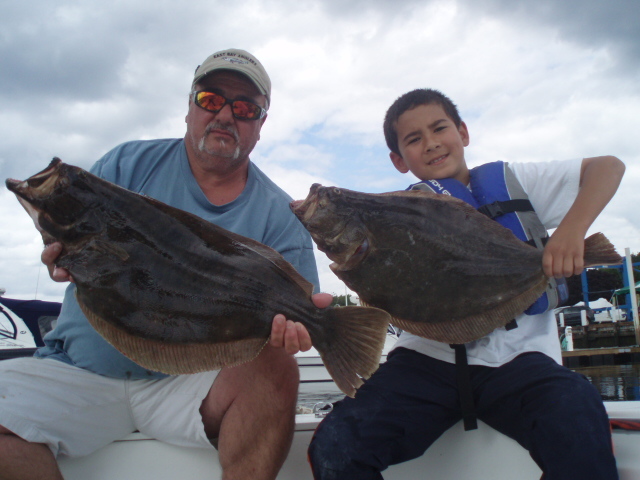 Nick Roach (left) of Warwick with a fluke (summer flounder) and his grandson Ethan Roach (right) of Jamestown, RI with a black sea bass. Both fish were caught on the same drift on Kettlebottom Outfitters charters. Black sea bass season opened Monday, July 11 and runs through December 31. Anglers have been catching keeper size black sea bass since the spring before the season opened while fishing for tautog and summer flounder. So this should be a good year for black sea bass. Minimum size this year is 13” with a catch limit of twelve fish/angler/day. Black sea bass are a great eating fish, often found on the menus of fine dining restaurants. They spend most of their time around the bottom and be found near rocky areas, jetties, rips , like a lot of bottom fish, they like structure. Sea bass put up a good feisty fight but they do not grow to be huge fish in the Northeast. Rigs often used to catch black sea bass have two hooks set-up 12” to 16” apart with a bank sinker to hold bottom. Squid or sea clams are often used as bait. Anglers often catch them while fishing for fluke, because you are on the bottom and likely fishing with squid. They can also be caught with jigs and many prefer this method. 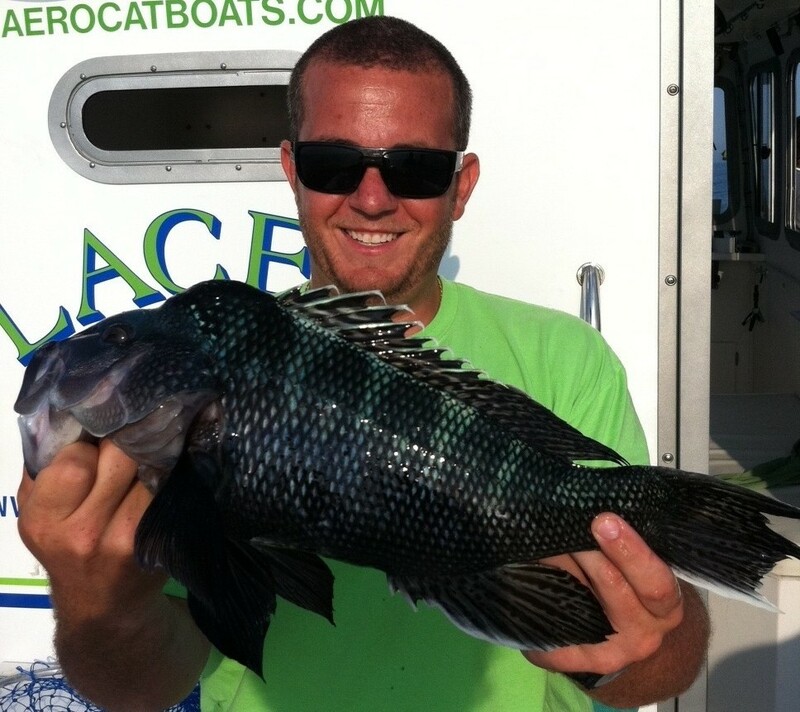 The best time to fish for black sea bass is from May through summer, when they are closest to shore. Any underwater structures… rocks, wrecks, piers and jetties will attach black sea bass. The larger males are general found in deeper water. Captain Roach said that Hi/Low rigs work great and that fishing for black sea bass is more about location than fancy fishing rigs. “Anchor up to target black sea bass specifically, otherwise you will often catch them on a drift when fluke fishing.” said Roach. Additional tips on cooking from the Massachusetts Division of Marine Fisheries can be found at www.mass.gov/dfwele/dmf/recreationalfishing . They suggest to try broiling black sea bass fillets. When broiling, fold under the thin section from the tail area to allow more even cooking. Place the fish in a greased pan; sprinkle with fresh ground pepper and paprika, and dot with butter or olive oil. Broil 5 to 6 minutes on each side, depending upon thickness, until the fillets are golden-brown. Be careful not to cook too long, as the fillets will dry and become somewhat leathery. The Seven B’s announces two tuna trips and is now taking reservations. The first trip loads at 10:00 p. on September 9 and returns September 11. The second trip loads at 10:00 p.m. on September 11 and return September 13. Cost is $450. Call 401.789.9250 for reservations. Kyle Grant of East Providence, RI went fluke fishing for the first time Sunday and landed this 27”, nine pound fluke (summer flounder) under the Newport Bridge with a standard fluke rig tipped with a squid strip and minnow. Kyle was fishing the incoming tide with a southwest wind. Fishing in the Bay and in near coastal waters is very good. Overall bass fishing in the Bay has slowed which happens each year at this time as the water starts to heat up. Water in many places in the Bay is in the 70 degree range. Fluke fishing continues to heat up too. Buzz at Maridee Bait & Tackle on Point Judith Road in Narragansett said, “Customers are picking up fluke off the sea walls at the Harbor of Refugee.” John Littlefield said, customers are catching fluke at Warwick Light as well as off Newport, with good fish coming out of 40 to 50 feet of water off Rose Island, Newport”. Kyle Grant of East Providence caught a 27” fluke (his first fluke) under the Newport Bridge using a standard squid rig tipped with squid strip and a minnow while fishing No Fluke Charters. Good fluke bite being reported at the Jamestown and Newport bridges, Dutch Island, Beavertail, and Austin Hollow and in front of the URI Bay Campus in North Kingstown. Gary Zera and David Cabral fished Seal Ledge off Newport for Fluke on Sunday and caught fourteen keepers (their limit) in about four and a half hours fishing the incoming and outgoing tides. Their largest fish was 27” with four fish in the 24 to 26” range. They were using squid strips and fluke bellies on standard squid rings. This is one of the best fluke fishing reports I have heard this year. Large bluefish have still have not made their presence known in force in the upper Bay, however fish in the 2 to 3 pound range are quite common. Some large blues surfaced Sunday south of the Jamestown Bridge with anglers having a lot of fun fishing the school with poppers said Eric Apollonian. Recreational fishing is worth over $180 million in R.I.
Last week NOAA announced quotas and other measures for bluefin tuna that underscore the nation’s commitment to sustainable science-based management of this vital fish stock. The allocations divide the available 2011 U.S. bluefin tuna quota of 957 metric tons among commercial and recreational fishing sectors for the fishing season that began on June 1. The General category, which includes commercial fishermen who use rod and reel, will receive 435 metric tons, nearly half the 2011 U.S. quota. Allocations for the other categories are as follows: Angling category (which includes recreational fishermen), 182 metric tons; purse seine fishermen, 171.8 metric tons; longline fishermen, 61 metric tons; harpoon fishermen, 36 metric tons; trap fishermen, 0.9 metric tons; and a reserve of 70.6 metric tons. The reserve is set aside for scientific research and to account for landings and dead discards. NOAA announced on May 27 that the Atlantic bluefin tuna currently do not warrant species protection under the Endangered Species Act. More information on bluefin visit www.nmfs.noaa.gov/stories/2011/05/bluefin_tuna.html . Joe Morrissey caught a near record 10 lbs. 2 oz. largemouth on Slack's Pond in Smithfield, RI. The fish was caught using a silver minnow lure and was 22.5 inches long. Don Hampton of Worcester County, MA caught three nice keeper bass fishing the channel pad in the East Passage off Barrington Beach. Yea!!! for Rhode Island. We have been blessed with an enlightened state Department of Environmental Management Marine Fisheries Division as well as elected officials that have made an effort to understand and explore what is working and not working in fisheries management and marketing. They have listened to recreational and commercial fishers and applied their learnings to make all fisheries better here in Rhode Island (not perfect, but we are striving to be better). The hope is that government officials, State and US Congregational delegations continue to actively explore and experiment with fisheries management and marketing models that work. Collect data and analysis data to craft management policies and models that allow our fisheries to be used at the highest levels possible for both recreational and commercial purposes while sustaining them at environmentally sound levels. As we strive for optimum and sustainable resource use we must continue to create consumer awareness, drive demand and brand our fish as fresh, nutritious, delicious and affordable while making native fish accessible and available to consumers. Such marketing efforts can do nothing but help both recreational and commercial fishing industries in Rhode Island. The hope is that government officials stay the course and not be distracted by vocal minorities in the fishing community that provide very little in the way of positive (proven) solutions to fishing challenges that face the our State and region. We need to look at positive solutions that have been proven successful based on research and performance. Two examples worth noting include the new fisheries management program for New England ground fish effective May, 2010 and the RI Fluke Sector Pilot which is now in its third year. In both cases, annual catch limits were put into place to prevent overfishing and to rebuild stocks. The idea was to provide fishermen with two options for controlling fishing effort. Fishermen could either form groups and fish an allocated share of the total allowed catch or fish individually with a limit on the number of days spent fishing. Fishing in groups with a total allowable catch offers fishemen flexibility to fish when market prices are highest or fish for species when they are available and other species are not. The results of these two efforts have been good. In the case of New England ground fish sector system, higher average prices for all species accounted for increased revenues. These were among the findings in an interim report released by NOAA's Northeast Fisheries Science Center. Researchers looked at gross revenues, fishing effort, average vessel performance, distribution of revenues, and employment for the first nine months of the 2007 through 2010 fishing years. Among the new trends, are increased revenues and prices. Revenues from all species on all trips by groundfish vessels in the first nine months of 2010 were up about $24 million over the same period in 2009. Another successful example of "Sector" management is the commercial RI Fluke Sector Pilot. Since its inception this Pilot Fluke Sector has grown, new members who were added as fishermen saw the benefits of flexibility… being able to fish when other species were not available or when market demand is highest. The sector has proven to be a very effective way to sustain the resource as well with record low discard rates (as much as 98% fewer discards than non sector participants). According to a paper presented April 7, 2011 by Chris Anderson, a professor of environmental and natural resource economics at the University of Rhode Island, "...the (RI Pilot) sector shifted fluke landings to times when they could maximize price. Comparing revenues… we find the sector program increased fleet wide (twelve boats in the fleet at this time) revenues over $800,000, including benefits of over $250,000 to non-sector vessels.” So the pilot sector enhanced revenue for its twelve members, but also incurred enhanced revenue for non-sector vessels by spreading available fish over an extended amount of time rather that flooding the market all at one time which reduces their market value. Our State and US Congressional delegations should continue to learn the nature of these recent success stories and understand them as these catch shares models were vehemently opposed by a vocal minority in the fishing community when first introduced. While listening to one small segment of the fishing community, some Massachusetts elected officials were convinced that “catch shares” management models were bad for fishermen, the community, the industry and the environment. These two programs have proved them wrong. They have been a big success, enhancing revenue for fishermen, the industry and they have enhanced fishing communities while sustaining the resource. If we have more fish, what do we do with them? Catching more fish is one thing. But how do we make them accessible and available to local consumers, enhance awareness of them and brand our fish as fresh, nutritious, delicious and affordable. A recent step in the right direction to market our fish includes the Special State Senate Task Force on Fisheries chaired by Senator Susan Sosnowski (D-South Kingstown and New Shoreham). The Task Force completed their work this month reporting on some great accomplishments. The passage of a bill by the Senate to establish a Rhode Island Seafood Marketing Collaborative will address regulatory and marketing issues pertaining to local seafood. And, passage of a bill urging our US Congressional Delegation to pass representation legislation giving Rhode Island a seat on the Mid-Atlantic Fisheries Council. We are on the right path, our pilot programs are working. Now it is a matter of enlightening others about their success and point to ways in which we can market fish as we enhance the fishery and boost our overall economy too. Register at Ocean State Tackle, Providence for the 1st Annual Striped Bass Southeast Asian Charity Fishing Tournament July 1 to 31st, 2011. Tournament proceeds go to the Laotian Community Center of RI to benefit their youth programs to purchase traditional music instruments, books and supplies. Visit www.oceanstatetackle.com or www.rilaocenter.org. Freshwater bite still very good for trout and largemouth bass. Joe Morrissey caught a 10 lbs. 2 oz. 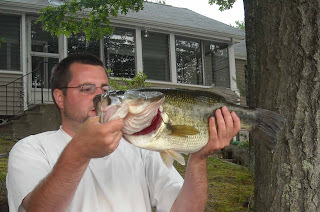 largemouth on Slack's Pond in Smithfield, RI. The fish was caught around 6 p.m. using a silver minnow lure and was 22.5 inches. Striped bass bite has faded a bit in the upper East Bay passage. Fishing continues to improve for bass around Block Island with fish in the low 30” range quite common. Large fish, in volume, have not yet made their presence known around the Island. 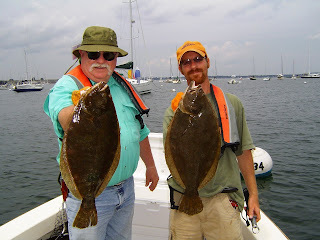 Fluke fishing is spotty off coastal RI southern shores with many shorts being caught. Good fluke fishing being reported in the lower Bay around the bridges, off Beavertail and Newport (Elbow Ledge) and at Austin Hollow off Jamestown. Thomas Schoeger reports on the RISAA blog “Spent (most)… of the day drifting from Dutch (Island) to Austin (Hollow). Caught four keepers 19” to 25”… and about 6 shorts.” Rich Sustello reports,” Fished the ocean for the past month from Charlestown to Sakonnet. All of the places I was successful last year have been disappointing. Tried up into the mouths of the bays the past two times with great success. Late Friday afternoon and evening, Lary Norin and I scored eight keepers with six of them over 20”. Black sea bass season does not start until July 11. The good news is that anglers fluke fishing are coming across a lot of nice keeper size sea bass.